Aries – Page 2 – Find Your Power Places! Jupiter – planet of fortune, success, and opportunity. Sounds enticing. 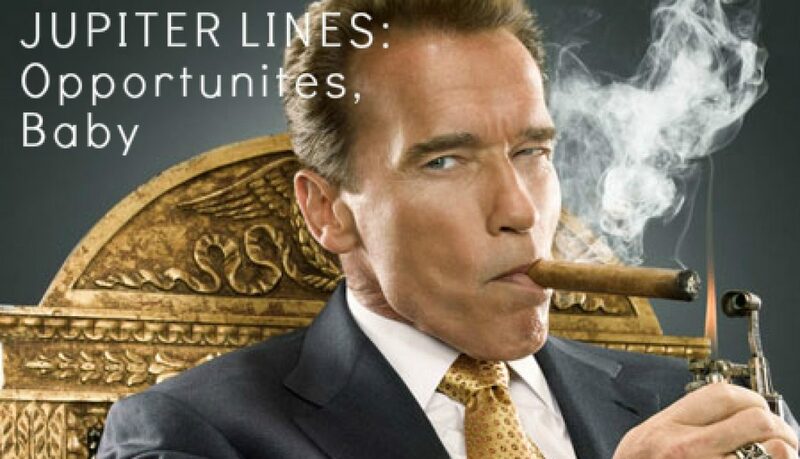 But how can Arnold Schwarzenegger’s astrology in California inspire all entrepreneurs, coaches, and teachers to follow your Jupiter lines? Astrologers are in general agreement, an have been for millenia, that planets are strongest when they are located on angles in your chart. Thus, if a planet rises, (near the Ascendant) it will affect your outer persona, and the energy people receive from you. Planets setting (near the Descendant) will strongly influence all relationship dynamics. When a planet appears on the bottom of your chart (IC), it will greatly affect your home life. If a planet graces the Midheaven (MC) or top of your chart, your career and public image will feel the energy of that particular planetary function of the human psyche. The study of how different planets influence these various angles of the chart is called Astrocartography. Let’s present a famous example of Astrocartography in action. Arnold Schwarzenegger was born in Austria, but moved to the U.S. to pursue a bodybuilding career, eventually blossoming into becoming not only Mr. Olympian seven times, but a huge Hollywood star, and finally arising as the Governor of California. One would imagine that California would hold some pretty potent energy for Schwarzenegger. California is a very powerful location for Arnold on many levels. But we are most interested in the planet Jupiter at the top of the chart, within four degrees of the Midheaven—the point of career and vocation in a birth chart. Jupiter on the Midheaven locations can bring some of the widest public recognition for our work. There is a need to keep growing professionally here and to push boundaries in our career, perhaps through teaching, publishing, or travel. The possibilities are endless for success and prosperity in the public domain here. We will also be highly visible along these lines and benefit from knowing influential or prominent individuals. Arnold moved to Venice near Los Angeles, California to pursue his bodybuilding career, in which he attained the status of Mr. Olympia seven times over, unprecedented before and since. He also published articles (Jupiter) for various bodybuilding magazines. In addition to his long and successful acting career, he defied all odds by becoming a foreign-born state Governor, tapping in to the fortunate gambling success of Jupiter. It is interesting to note first, that Jupiter is the biggest, the most gigantic of all planets. (300 earths fit inside of Jupiter.) Schwarzenegger was literally known as the biggest man, and in a VERY BIG way: he won the Mr. Olympia competition seven times. When Jupiter is strong in a location, extravagance, exaggeration, and extreme expressions, usually to our benefit, will be very likely to occur. Also, we must note that Jupiter is in Scorpio in Arnold’s chart. This means that in California, the planet Jupiter is in Scorpio at the most public place of his chart. Arnold’s most famous roles—Terminator, Predator, Total Recall, Commando, and Conan the Barbarian—are all very Scorpionic indeed, with major themes of apocalypse, murder, war, alien invasion, and world takeover by artificial intelligence. Scorpio is also the sign of power gained through merging our resources with others, such as in the political sphere or marriage. In California, Arnold did both as he married into the Kennedy family through his relationship with Maria Shriver and reigned as the “Governator” for eight years. Thus, Arnold wields his most amplified and expanded (Jupiter) sense of power (Scorpio) over the earth in California. For entrepreneurs especially, finding locations where Jupiter is prominent, and where the sign of Scorpio is strong, especially on the angle of career, could be some of the best places to post up your business, seek clients, or get chummy with influential locals. To learn about your Jupiter lines, book an AstroLocality consultation here. These days, few of us live where we were born. This fact alone suggests the vital importance of interpreting our birth charts as if we were born in the area we currently live. Although the imprint of your birth chart will always be carried with you, your influences will be vastly different depending on where you travel to or reside. Thus, all of us would benefit from recognizing the differences in our charts from one location to the next. The foundation of AstroLocality, or Relocation Astrology, lies in a few basic ideas. 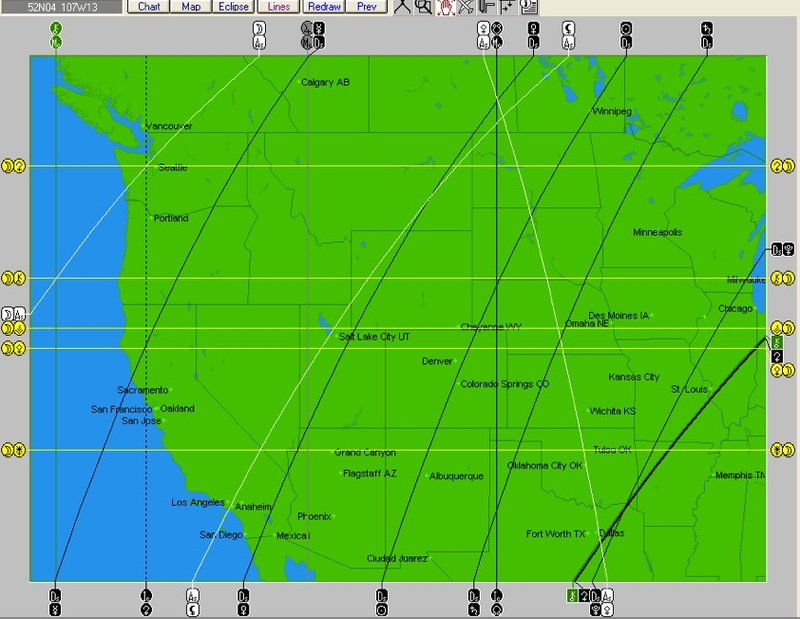 In Step 1 of this artful science, we must relocate your birth chart to a city you would like to move or travel to, using that city as your location. We can also relocate your birth chart to where you currently reside. This relocated chart is then interpreted to tell us what influences and life experiences will be most dominant in that location for you. The various planets—which represent intelligences, teachers, and psychological functions—will become more or less prominent, and they will radiate energy into certain areas of your life. If, for instance, you were born on the East Coast, but moved to California in your 20‘s, all of your planets—the various psychological forces within you—would be radiating their influence in different houses, or spheres of life experience. Just by moving one time zone, you might shift a concentration of planets in your 6th house—a heavy burden of daily tasks, health issues, and stress—into your 7th house, and now your area of relationships will be affected by those same planets, affecting all partnerships in ways to particular to those planetary meanings. If you move Saturn and Pluto into your 6th house, and you are seeking a light-hearted, playful, romantic relationship, this shift will not support you at all, since Saturn is about serious commitments, hardship, and tests of stamina, while Pluto is about dramatic intensity and transformation. All aspects of life—career, love, financial fulfillment, family, spiritual and artistic pursuits—have their more ideal and less attractive power places in your country of origin and on the earth as a whole. No location is perfect for all aspects of life. But with the many aspects of AstroLocality we describe in other posts, and with the clarity of a client’s intention for relocation or travel, we can weigh the pros and cons of specific locations to find the most supportive places for an individual, a couple, or a family. In this process, we often discover significant locations that may never have been on your radar.